Stunning an animal correctly will provide better meat quality. Improper electric stunning will cause bloodspots in the meat and bone fractures. Good stunning practices are also required so that a plant will be in compliance with the Humane Slaughter Act…See Good Stunning Practices. Surely if we consider pre-Grandin conventional methods of slaughter, Grandin’s methods appear to offer some modest reduction in animal suffering. But why should we accept the backward, the cruel and the barbaric as a barometer of animal well being? That would seem to be a serious flaw in Grandin’s judgment. In fact Grandin’s underlying assumption is that killing animals for food is a given. The only thing we can do is make the process less miserable for them. This assumption dismisses any serious attempt to protect the interest animals have in not being used as a human resource in the first pace, which begs the question: If Grandin loves animals so much, then why doesn’t she use her influence to educate people on why we should spare them a life of exploitation and violence in the first place? Why instead did she choose to apply her life’s work to better forms of execution? 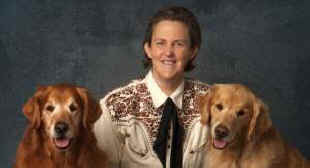 Throughout Grandin’s website, she portrays herself as a genuine animal lover. In some of her articles, she even seems to suggest that there is a moral basis for condemning animal exploitation all together, based on her findings about animal behavior and intelligence. But then in other sections of the site, such as that pertaining to humane slaughter, she describes in chilling and clinical detail the stunning and slaughtering of animals in what she proposes as “humane” as opposed to traditional practices she views as decisively “inhumane.” For the animal victim, it’s hard to imagine what such gradations of pain and suffering could mean, if anything, in the process of having his life snuffed out of him. Now of course, Grandin has become the poster child of the meat industry. She’s handed them a golden opportunity to present an ethical facade to mass killing. And she’s become somewhat of a cultural icon thanks to the HBO film about her life’s work. Many people now even buy into the idea of the word “humane” used to describe the killing of a living being against his will without questioning the obvious and glaring contradiction. Grandin’s critics will justifiably claim that her love for animals simply translates into more efficient methods of killing greater numbers of animals. The increasing number of animals being killed for food each year is a testament to this assertion. And the sale and marketing of “humane” animal products is soaring. The animal rights position holds that the interests of animals viewed as property and used as commodities will consistently be subjugated by even the most trivial interests of the human property owner. We see this happening all around us. This is what allowed the owner of A & L Poultry in California to walk away from 50,000 chickens in their care, leave them to starve in captivity, blame it on rising feed costs and then walk away with legal impunity. The power of the property owner over his animal property is protected even in matters of life or death for the animal property. In both captive bolt and electrically stunned animals kicking will occur. Ignore the kicking and look at the head. To put it simply, THE HEAD MUST BE DEAD. When cattle are shot with a captive bolt, it is normal to have a spasm for 5 to 15 seconds. After the animal is rolled out of the box or hung up its eyes should relax and be wide open. After electrical stunning, a properly stunned animal should have a rigid (tonic) phase followed by a clonic (paddling of the legs) phase. This is an indication of a grand mal epileptic seizure. The seizure induces insensibility. Now imagine for a moment that the victims here are humans. Could you with a clear conscience use the term “humane atrocity” or “humane genocide” to describe this practice?